Paisy nikaly ksi tariky sy. Good decision which will give PMLN a small victory but in actual Nawaz has got nothing as he was getting similar treatment when he was in jail. He was going to go to the hospital anyway after his bail rejection! Now they can't act masoom. And they have to go to the hospital now. If he won't then nobody would listen to him on his next drama! But 6 weeks is too much! Should have been 4 weeks max! a buffalo has now been cut loose, now he will stay in hospitals and cause instability in Pakistan for rest of his life, zardari will follow the same path. What about terminally ill other convicted felons in jail? I think it’s a very good news for them, theirs families get sehat cards and they get out for treatment. For crying out loud how long more for this drama. Why can't this crap system of judges come to a conclusion. 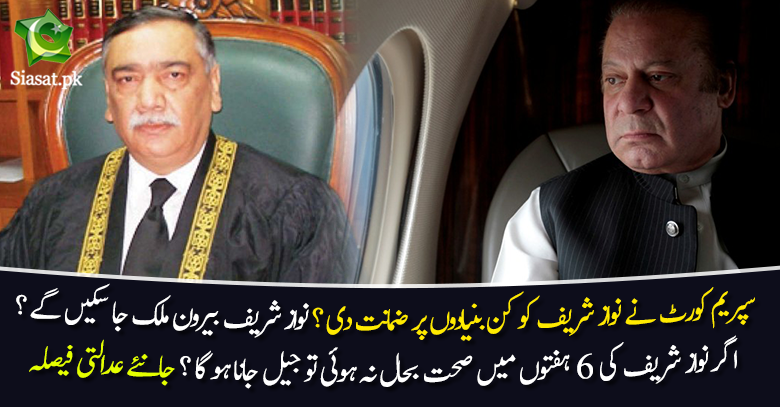 PLEASE REQUEST P.M he should move an application through his Attorney General to Supreme Court Of Pakistan To Give Bail to all the prisoners Suffering from Heart Disease , Cancer,HIV and other serious illnesses for at least 6 weeks. If Nawaz shareef doesn’t trust Pakistani doctors so he can invite any foreigner doctor to treat him in Pakistan. Although everyone knows Nawaz Shareef is a fraud and he just wants to run away. And them government get criticized for not delivering justice. There was no precedent in the past history, so it was totally court's prerogative.